Review posted June 9, 2018. Henry Holt and Company, New York, 2017. 122 pages. 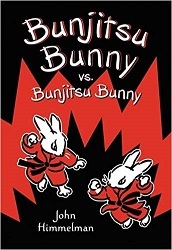 I still say that John Himmelman’s books about Bunjitsu Bunny are perfect for readers who are just becoming fluent enough readers for chapter books. There are pictures on every page, and not a lot of words, so even though there are more than a hundred pages, the book is not daunting. And each chapter is a self-contained story, and most of them have some kind of pay-off or surprise ending, so reading them is rewarding. Now I’ll admit that there’s nothing excitingly new about this new volume, and it doesn’t matter what order you read the books in. So I’m not struck with new enthusiasm about this series or itching to tell you about an especially clever new story. However – collectively, the books are wonderful. I’m so glad they exist. Kids who already love reading about Bunjitsu Bunny will be happy for a set of more stories. A bunny who’s skilled at bunjitsu and can conquer every foe, except maybe herself. What could be better?